We still have some openings for the February dates for Paws and Read! See below for details, and call soon if you are interested in signing up! Reading to Faye or Rhia, the library’s Therapy Dogs, is a fantastic way to bolster a child’s reading confidence! 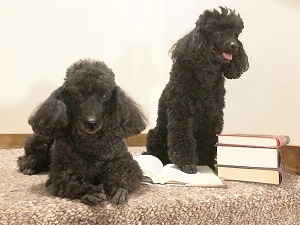 Children who are independent readers can make a 15 minute appointment to read to one of these wonderful therapy dogs; on each date, 8 children total will get a chance to have either Faye or Rhia’s undivided canine attention. Pre-registration required ~ call the Children’s Room at (978) 456 – 2381 to make your own special appointment to read to Faye or Rhia.